The Nike Air Max Sequent 4 is the new version in the Air Max Sequent line of shoes. Just to let you know, I have done the review of Air Max Sequent 2 and Air Max Sequent 3. You may want to check those out later. The breathable mesh upper in Air Max Sequent 4 keeps the interior part cool and dry. It features a heel counter which keeps the foot in place. With every stride, the U-shaped Max Air unit provides effective response to impact shock while the phylon sole enables lightweight, flexible, and comfortable feel. There are not many cons I can point out yet, except that the heel counter may make the shoe a bit tight. Customer rating can be such a good tool when it comes to making a decision on which products to buy. 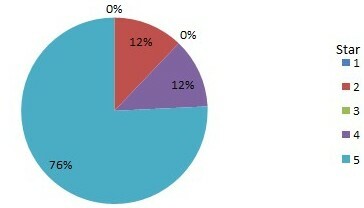 Though there are quite a few customer reviews on the shoe, I managed to obtain a pie chart which may somehow help. You may click on the chart to find out more about the reviews. The guy in the following video quickly introduced the upper and showed the Max Air unit of the Air Max Sequent 4. He quickly introduced the outsole and it’s flexibility. Finally, he displayed the removable insole. It’s a quick video that basically introduced you to what the shoe has got to offer. Enjoy it. The Nike Air Max Sequent 4 is the new version in Nike Air Max Sequent line of shoes. There are not too many reviews on the shoe. I have done some research and apparently, there are some experts and users that have reviewed the shoe. Their opinions are highlighted on RunRepeat site. The following are what those reviewers say. Some testers said that the shoe can be easily slip on. Another runner was very delighted with the shoe shock absorption capabilities. Based on different opinions, Air Max Sequent 4 is a very comfortable, flexible, and lightweight sneaker. There are some wearers that feel the fit is alright and there are some that think it’s a bit big or narrow. With all that it Air Max Sequent 4 has got to offer, it seems like it will be a right shoe for road running and other similar training. The shoe isn’t too expensive. 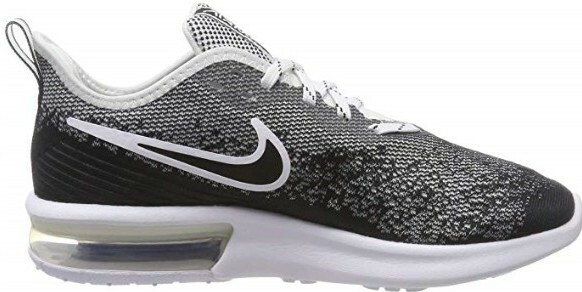 If you think Air Max Sequent 4 is the right shoe for you, you may want to have a look at the best places to buy above. Do you still want to know more? Keep reading. The main parts of a shoe are usually the upper, midsole, and the outsole. The upper is the part of a shoe that covers the toes’ area, the instep and the back of the heel. It’s the part that’s fixed to the sole. The midsole is the middle layer between the insole and outsole. The part of the shoe that makes direct contact with the ground is called the outsole. This is the area that grips the ground. The upper features a breathable mesh that wraps around a foot and enable secured, snug fit. This material is flexible and lightweight. It is supported by synthetic overlays that enable the structure to hold together in a nice, elegant form. Underneath the structure (mesh upper) is a partial inner sleeve. The sleeve is made of fabric (a sock-like feel) which wraps around the foot to provide a secure, snug fit. In the heel counter is a piece of molded foam which securely keeps the foot in, so there is no chance of indeliberate slip off. The tongue is designed to enable comfortable and effortless slip on. You may also notice a lightly padded structure on the collar. It’s not just there for no purpose, it’s designed to provide additional level of comfort and security. The conventional lace-up closure complete the shoe look in the upper. The U-shaped Max Air unit in the heel is still the same as the previous version. It is very responsive and enables an effective impact shock absorption during each stride. The Max Air unit was designed, with the right amount of air, to provide rearfoot stability and enough response to impact force. The phylon material runs the length of Air Max Sequent 4. Some of the best quality features of phylon material are usually lightweight, flexibility and its good cushioning. The material is usually made from EVA (Ethylene-vinyl acetate) Foam Pellets using compression moulding technique. Basically, the EVA Foam Pellets are compressed and then expanded due to some heating technique. The expanded structure is then cooled into a mold. This molded foam can then be carved into different forms. The phylon is a very light and springy material which assists the Air Max cushion when it comes to creating the right amount of responsiveness in each running or walking stride. Nike Air Max Sequent 4 is made of a durable rubber outsole which can withstand wear and tear for a very long time. On the outsole are elegantly structured flex grooves that contribute to the lightweight and flexibility of the shoe. These grooves encourage freedom of movement and let the foot flex naturally during running or walking gait. The outsole structure of Air Max Sequent 4 is quite different from the previous models. This new structure offers good traction and can function well on any surface. The midsole enables some level of shock absorption. Also, the U-shaped Air Max foam unit under the heel offer cushioning that opens a door for additional shock absorption during each landing. This increases the foot support and provides better running experience. The Air sole unit was first featured in Nike footwear in the 1978. Fans could not see the air unit, but they were able to feel its comfort. Nike Air Max 1 is the first version in the line of Nike Air Max shoes. It was debuted with visible air unit in 1987. That was the first time fans were not only able to feel the comfort of the air unit, but they could also see it. Three years later (1990), the Air Max 90 was released with larger air window, providing better feeling of air unit comfort. Nike has released many Air Max shoes over the years in a variety of designs and different colourways. The Air Max line of Nike shoes are very popular among athletes, pop stars, sneakerheads and so on. Wow thank you for the very thorough review. I have been searching for Nike Air Max review lately for my brother. He has given us a hint that it is what he wants for his birthday. This just made my search much easier. Thank you so much. This is very helpful. I love it. With Nike being such a highly esteemed brand, that’s a big plus from the start. To me, one of the most important features of a shoe of this type is the flexibility. I noticed that this was mentioned often in your review, so that looks like quite a strong point. The other things that stand out to me are that it is lightweight and breathable. I’m more impressed by how a shoe works and feels than about how it looks, but this shoe does look good, too! Thanks for the great review! Thanks for true review of the The Nike Air Max Sequent 4,this s the second time am stumbling on your blog and you always come up with the review of the best shoes around. I think the The Nike Air Max Sequent 4 is very cheap and affordable and I like it because of it lightweight . I have read the whole review about this information.This is really a wonderful information about Nike air Max squent 4.I like shoes of Nike brand. This is really a great review for us.I like this review very much.I will share this article with my friends.I believed they will also like this review.Thanks for sharing this awesome product review with us.